Yesterday's post raised a few questions about other aspects of the outfit - specifically the black suede shoes and cream-coloured cardigan. I think it's interested to discuss both together, for stylistically they have many things in common. I'm a fan of black suede shoes for their rarity. You see very few people wearing them, and the light-sucking texture of suede is rather unexpected. For that reason I think they work particularly well with smarter outfits than the one I was pictured in yesterday. 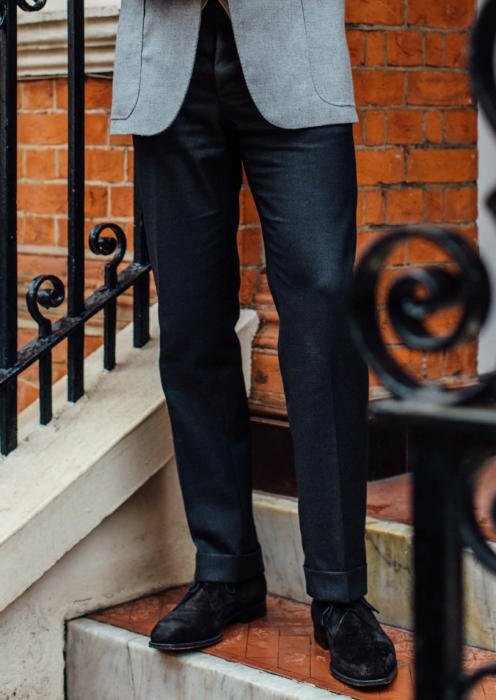 For example a navy jacket, grey flannel trousers and open-necked white shirt is a great office combination, with black suede adding that touch of character. However, their applications are relatively limited beyond that. They are surprisingly striking (given their dark uniform colour), and I find I only wear them with such formal outfits or other, relatively monotone ones. The cream cardigan is similar. It is from Drake's - their sleeveless model - and I slimmed down the fit myself a little by sewing up the side seams. I love it. But again it is surprisingly striking, given it is not patterned or particularly bright. It stands out perhaps for being unusual, and pale, and I find I only wear it with quite simple outfits - usually involving grey jacket or trousers. By contrast, the navy and biscuit-coloured versions get worn all the time. To the extent that the navy is getting a little ragged. (But then I like that in knitwear...). Both are worth exploring, but in their way are as expressive as yellow socks or a bright-green handkerchief. Black-suede derby from Edward Green, Shelton model on the 890 last. Cream cardigan not currently available from Drake's. The same model is available in other colours in lambswool. You can follow the discussion on Black suede shoes, and cream knitwear by entering your email address in the box below. You will then receive an email every time a new comment is added. These will also contain a link to a page where you can stop the alerts, and remove all of your related data from the site. Drake’s knitwear is made by William Lockie so you might just as well buy them with the original label at a better price. A Hume has the full range. These last few articles on colour and combinations have been fantastic . As much as we like your high end stuff it’s these articles that apply across the board and within everyone’s reach . Also, the new site design is brilliant , works a treat on mobile devices and takes the site up another notch . Got to mirror this sentiment! Hello Simon, I have what I think is an interesting question (at least to me it is). We all know navy is the smartest colour, but why? I have always agreed with the notion, and thus not questioned it. Given your considerably more extensive knowledge on menswear perhaps you can answer this (or ask G. Bruce Boyer, who I hear is a reader – congrats!). You are right about the rarity of the black suede. Indeed, they could add a touch of sharpness to an outfit. But being less versatile than other colors, I personally avoid them. 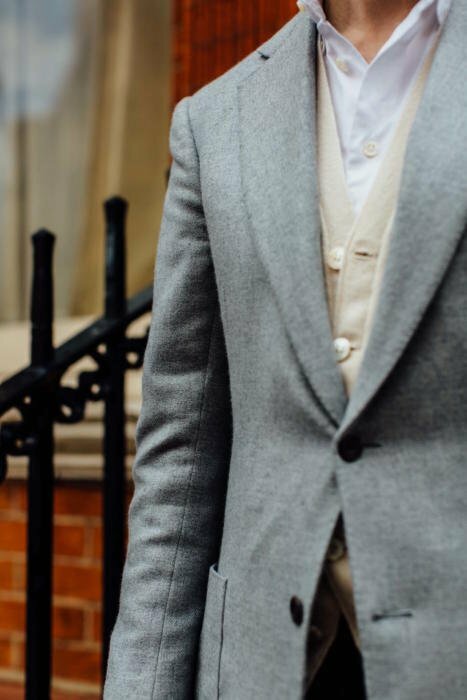 As to your cardigan, I wonder whether one couldn’t also use it as you once did with your odd waistcoat, yet worn with a navy blazer instead of a suit for evening events, for instance. Wouldn’t a cardigan downgrade the formality of the whole outfit on such occasions? I muss confess that I do not like waistcoats. Long time reader, first time commenter here. You said you stitched up the sides of the cardigan, how did you do that? I have a sleeveless cardigan that is slightly baggy that I would like to do the same to. That would be fantastic – being a fairly slight bloke I find even size XS (knitwear in particular) leaves too much room around the middle. Thanks also for running such a great resource – it’s such a handy reference! I strongly disagree. 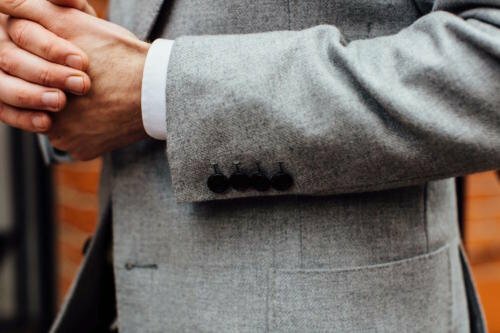 The only proper suede shoes are a shade of brown; cream and black — NO and finally cardigans should not be worn under a suit or sport jacket. Black suede, normally with a crepe sole, shoes are pretty common attire with a suit in Paris. Have a look next time you are there. The crepe sole lends to such an outfit – no matter how smart the suit is – its casualness. What are your thoughts on wearing black suede chukka boots in a more casual setting? I’ve got my eye on the C&J Tetbury boots. I like black suede, as you say it is something slightly different but still quite formal and you can wear with a wide range of outfits. I tend to wear mine with grey flannels, a white shirt and a black knitted tie. but also wear with jeans. They do need to be a simple and clean shoe though. I wear a lot of cardigans, and have the same issue as you, I am reasonably slim so find a lot of them a bit bellowy to wear with formal wear. – do you have your open neck/no tie shirts specifically tailored such that the collar stands so well, or is it a regular shirt for use with tie shirt, and what therefore is the collar style and cut please? – one of the challenges with open neck no tie is how open – just a top button open can be a bit snug/tightly wound whilst two open buttons can look all too much and on certain shirts the midpoint is ideal – which you appear to have achieved – if so how? I know that in the US one organisation is selling a form of gel tabs that are hidden which allow this to be perfected – not sure if you have seen them? It’s a particular cut I developed with shirtmaker Luca Avitabile over the years (and we now use on RTW shirts). And equally on the chest buttons, I move the third button up a centimetre, so the opening isn’t so big. The pleasures of bespoke.